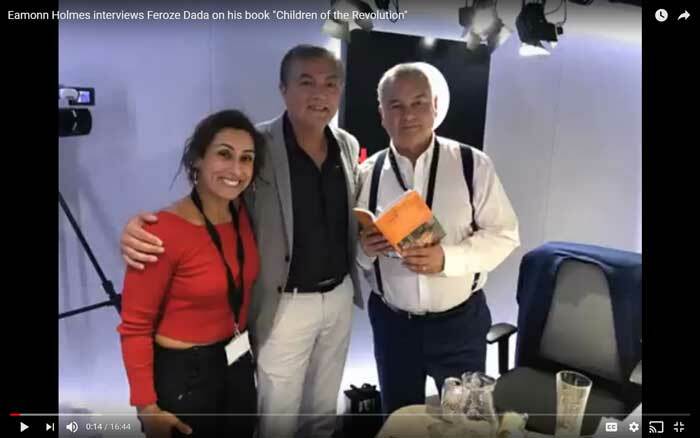 Congratulations to Feroze Dada for a most colourful and spectacular book launch at Watkins iconic bookshop in London Cecil Court on Tuesday 3rd of July. Great entertainment was provided by singer Saira Peter and her musicians which immediately drew a crowd outside. A fantastic event as the photos show!! Children of the Revolution is a book of converging worlds. In it you discover the very human weave of courage, perseverance and vision, woven with a delightful touch of humour and surprise. It also has the beguiling pattern of a journey unfolding. And as it unfolds, you learn. And you are inspired. Children of the Revolution is both an inspiration and a teaching. It unfolds as a flower does. As you are taken along the twin tracks of a journey through a conflicted region, and a personal journey of reflection, gradually what remains with you is a story about Loving Kindness. Appropriately it starts with a family gathering and ends with the family at the monastery. These are the ripples across the lake, ever-widening patterns of mettā as the children are sheltered, fed, educated, and then go into the world. Work on the Education Centre building at Phaya Taung monastery, Inle Lake has progressed substantially and the building is expected to be completed by the end of July. One of ‘today’s finest lyric tenors,’ Joseph Calleja will be performing for one night only at the V&A Museum along with ‘the people’s soprano,’ Rebecca Newman. The programme will include a mix of mix of opera classics and legendary tunes, amongst them Signore Ascolta, La Vie en Rose and O Sole Mio. This live concert event will take place on Tuesday 13th June 2017. The event will be focused on raising funds for the Inle Trust Charity www.inletrust.org.uk to allow the continuation of the monastery orphanage & school work currently going on in Lake Inle, Burma.